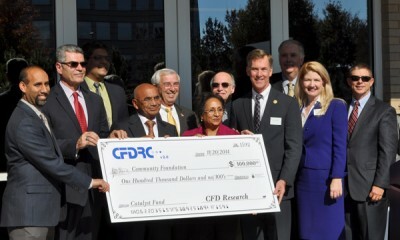 CFD Research Corporation (CFDRC), located in Cummings Research Park, is making a major investment in the community through two new gifts. CFDRC is contributing $100,000 to the Community Catalyst Fund at the Community Foundation of Huntsville/Madison County. The Community Catalyst Fund is a new endowed fund that will provide a perpetual source of grants for improving quality of life in Huntsville and Madison County. CFDRC is also contributing $50,000 to Habitat for Humanity of Madison County. Habitat is an ecumenical Christian housing ministry that seeks to eliminate poverty housing from our community and make decent shelter a matter of conscience and action. The Community Catalyst Fund is an endowment funded by unrestricted gifts that will empower the Community Foundation to make annual grants for the betterment of the community. In August 2014, Torch Technologies provided the inaugural leadership gift to initiate the Community Catalyst Fund at the Community Foundation. Torch donated $50,000 to jump-start the fund, and provided an additional $100,000 as a challenge grant to match other corporate and individual gifts to the Catalyst Fund. on Thursday, 20 November 2014.